Hospitality Member of the Year! Serving the Barrington Region...and more! 2012 & 2013 "Best of the Burbs"
We support our community, local businesses, and are a proud memeber of the Barrington Area Chamber of Commerce. Visit our chamber webpage here. 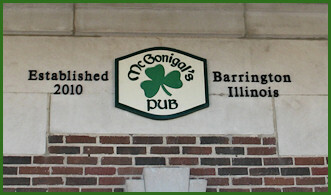 McGonigal's Pub provides a traditional Irish Pub setting with a warm, fun and inviting atmosphere. We have twenty beers on tap and since opening have been repeatedly told by customers that our imported selection and Guinness pints are nothing short of outstanding. Our menu has a great variety of options and features delicious Irish fare - fish and chips, shepherd's pie and boxtys are some of our top sellers - plus we easily have the BEST burger in the region! Our full kitchen is open for lunch and dinner seven days a week. Our first level is a classic Victorian style pub with a huge bar that's set up perfectly for socializing, and also includes "The Vault" seating area which is inside an actual bank vault (our building was originally an old bank, circa 1913). Our second level features another full bar and ample seating for dining, plus it's available for special events, private parties, banquets, etc. We have two music stages and feature a variety of live entertainment - Irish, rock, blues, and solo artists - every weekend, and some weekdays too. We know you'll be impressed with McGonigal's, and you don't need to be Irish to enjoy yourself here! 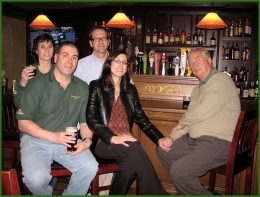 The McGonigal family at the Moore coffin on the bar in the pub's 2nd level. This coffin was created in honor of my mother Mary, who passed away in March 2006. 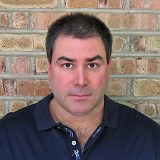 Though born in Nebraska, Bryan has truly been a permanent long-time resident of this area, growing up in Palatine and since 1997 has called North Barrington home. Sales and marketing is his background, but being a "professional customer" of countless establishments over the past 20+ years, Bryan has a great feel for the service side of the industry and has always been enthusiastic about eventually being part of it. That interest turned to a passion in 2008, when he almost took ownership of a sports bar in a neighboring town. Bigger and better plans evolved from that experience, with the end result being McGonigal's Pub. Bryan is third generation Irish with (not shocking) a strong affinity for beer. It's highly likely he'll gladly join you for a pint or two at the pub! 2006-2009: Owner - BLAM Productions, Inc. Specialized in marketing and communications consulting for small to medium sized companies. 1991-2006: Marketing/Sales/Product Managment - Medline Industries, Inc., Mundelein IL. Involved with numerous jobs and responsibilities over a long career at this privately held medical supply manufacturer and distributor. 1983-1987: Loyola University of Chicago. undergraduate studies, Economics & Psychology. Formerly involved in the entertainment industry; co-owned and operated a moblie disc jockey company for many years and had a brief stint in radio. Additional sales and marketing experience includes work with distribution and building supply companies. BASSET certified, with other necessary restaurant certifications forthcoming. There's an interesting story as to how this concept came to be . . . and though it's still a ways away from actually being finished and open for business, I will share with you the steps that led to the idea, the acquistion of the building and everything that's happened since that time. However, this will be a story for a later date once I have a bit more time to get it all down in writing. Your patience is appreciated. McGonigal’s Pub (105 S. Cook St.) will occupy both levels of the building, with the first level being a traditional Irish Pub...providing the type of experience these establishments do best. Besides an expansive variety of libations, there will be a full kitchen offering a menu of traditional Irish food along with many pub favorites - in fact we’ll aim to serve the best burger in the area. The second level is a welcome extension of the pub that can seat roughly 100 patrons. It includes its own bar and will be used for extra seating for diners, banquets, private parties, special functions and of course plenty of extra space for the pub during busy times. There will be enough HD televisions upstairs to satisfy all sports fans, plus we plan on regularly offering live music & entertainment on both levels. 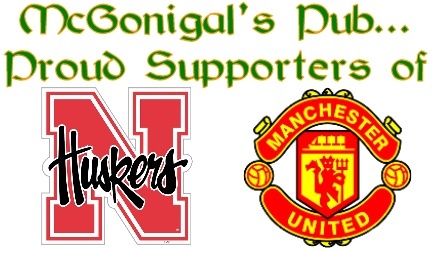 Overall, McGonigal's Pub will present to its patrons a warm, inviting, fun atmosphere, and you won’t even need to be Irish to enjoy yourself here! This building was originally built in 1913 as the First State Bank of Barrington, but since the 1940’s has a rich history of being popular restaurants. For the past ten years it has been used for retail purposes, best known in town as the Wolf Camera building. We still have quite a bit of work to do to get it back into bar/restaurant form, but I can promise that once done you will not be disappointed! If you’re familiar with downtown Barrington you’ll know exactly where the new businesses (the Pub and Park Avenue Wine Bar) are located. If not, suffice to say it’s probably one of the most visible spots in town – off of Cook Street a block east of Rt. 59 (Hough Street), a block south of Main Street (Lake-Cook Road) and on the south side of the Metra train tracks just a couple blocks west of the Barrington train station. Easy access, a ton of public parking and surrounded by shops and other businesses.